This is John, our provision coordinator at our Friday night hot food kitchen Soup Run. For years, we have been opening up our doors to guests, for those in need of a good meal and the partnership and community on offer at Mustard Tree. John has been heading up the cooking operation since 2013, providing for around 100 guests every week. 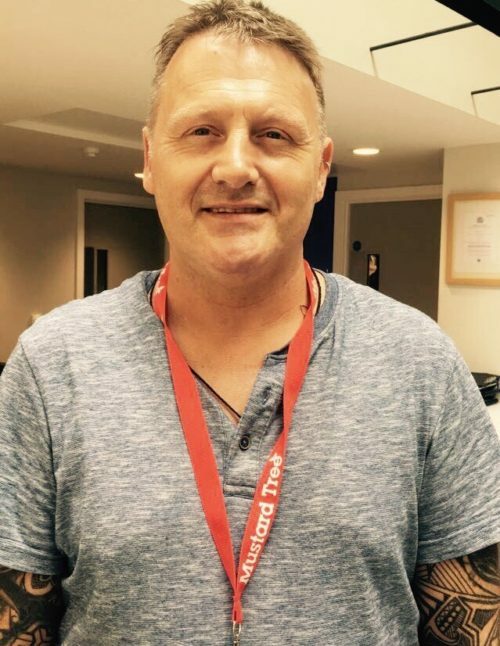 To celebrate our volunteers this Volunteers week just like John, he shared some of his story. “I started Volunteering at Mustard Tree back in 2013 at the beginning of December at the Friday night Soup Run. I moved down to Manchester back in 2012 looking for work. I had begun volunteering in North Manchester in various roles and one day was at an event in the Town Hall. and Mustard Tree had a stall there recruiting volunteers and I signed up. Back in 2010 my son & myself nearly found ourselves homeless due to me having a serious accident and I got dragged through the all DWP system, so I kinda know what these guys and gals are going through and wanted to support them by volunteering in some way. Over the first year I supported the evening in just about all the different roles and eventually spent about 6 months helping to welcome people. One Friday I turned up and no kitchen staff were present. I took the opportunity to Chef for the evening then over the proceeding months I carried on in the kitchen. Over time I slowly changed what we served up, liaised more with Mustard Tree to help alleviate wastage from donations and increased the choice of food. Now, we serve a 10 course menu, which I believe shows we value our guests and gives them a little bit more dignity with a better choice of food on offer.